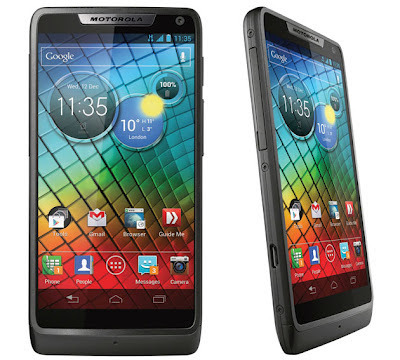 Motorola and Intel launched the “Intel inside” device, the Razr i. It is the first Intel device by Motorola and also the first smartphone sporting a 2 Ghz Intel Processor. The Razr i is similar with the recently announced Droid Razr M for Verizon Wireless, the only difference is that the former runs a 1.5 Ghz dual core Qualcomm Snapdragon S4 while the latter launched with the single core 2 Ghz Intel processor. Intel is making some headway into the smartphone business. It has partnered up with major players such as Motorola, Orange, Lenovo, and ZTE to expand its presence in the mobile world as its core PC business faces a looming slowdown, with consumers shifting their disposable income toward smartphone and tablets and away from laptops and desktops. The Razr i is equipped with several attractive features such as a 4.3 “edge-to-edge” Super AMOLED display, a 2000mAh battery, and 32GB internal storage expandable with microSD. Motorola has its improved camera application. Razr i has a 8 MP camera, a dedicated camera button which can wake and take a photo a bit more than a second. The phone packs a single core 2-gigahertz Atom Z2480 “Medfield” chip which allows the camera to capture 10 shots in less than a second and has a dedicated camera key — features not available on the Qualcomm Snapdragon-powered Razr M. Intel has also stressed that their processor has been specially optimized for smooth webpage browsing. Razr i runs Android 4.0 Ice Cream Sandwich. It features a penta band antenna, which means it can roam in the U.S., and is compatible with HSPA+ 14 networks run by AT&T and T-Mobile. Razr i offers a fast camera, an edge to edge display, impressive battery life, fast UI and web browsing. The alliance between Motorola and Intel is a significant stepping stone for Intel to get deeper into the smartphone market, with Motorola a unit of Google, which runs the Android ecosystem.